You could win $10,000 for your own Backyard BBQ plus play daily for the chance to instantly win up to $500 from Amazon.com! Eligibility: Open only to legal residents of the fifty (50) United States (including D.C.) who are at least eighteen (18) years of age. 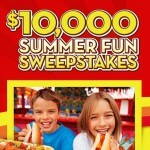 Entry Dates: Begins May 1, 2010 at 12:00 a.m. Eastern Time and ends June 30, 2010 at 11:59 p.m. ET. How to enter: Visit bars.promo.eprize.com/summerfunsweepstakes and follow the links and instructions to complete and submit the registration form. Entry Limit: Each participant may enter/play one (1) time per day. Tell A Friend Program: For each referral with valid email address, you will be given one (1) additional entry into the Grand Prize Drawing up to a total of three (3) additional entries per day. (1) FIRST PRIZE: $500 Amazon gift code. ARV: $500. (3) SECOND PRIZES: $100 Amazon gift code. ARV: $100. (5) THIRD PRIZES: $75 Amazon gift code. ARV: $75. (7) FOURTH PRIZES: $50 Amazon gift code. ARV: $50. (50) FIFTH PRIZES: $20 Amazon gift code. ARV: $20. Prize Limit: One (1) Instant Win Game prize per person. Drawing Date: On or about July 30, 2010.